The NTA (National Transport Authority Ireland) is busy publishing plans and projects that involve demolishing buildings, houses, cutting trees re-routing, handing over Dublin bus routes to other operators and increasing fares (simply by changing zones). When the question comes up about the estimated amount of money to spend on various public transport projects the favourite wording is “indicative figure”, (the same “indicative figure” that was mentioned regarding the Children’s hospital). Another word used is ‘guestimate’. Routes 14, 15 and 16 are the relevant ones for Dublin 4. They are the radials, or corridors that would replace the existing routes 4, 7 and 1. By the last week of March, before the public meetings for routes 14 and 16 came about, the NTA had received 30,000 submissions. And it looked as if spine C through Ringsend up to Sandymount St. Johns church had been scrapped altogether. Something got lost if not in translation exactly, definitely in communication. Because the published route 16 between Talbot Memorial Bridge/ City Centre and Ringsend is actually an additional bus corridor. Basically, route 16 gives the commuter a chance to hop on a bus instead of getting on the Luas and so avoid having to walk across the East Link. 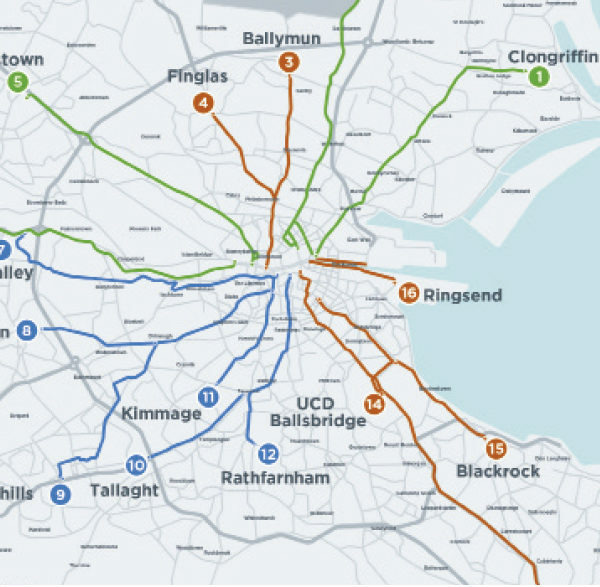 The other such route supplementing the spine B from phase two links the city centre with Ballsbridge towards UCD. This route 14 will commence at the junction of Lower Fitzwilliam Street / Lower Baggot St and continue up to St. Vincent’s hospital. There, the corridor will run along Nutley Lane and so join up with route 15 going out towards Bray via UCD Campus (see map). Here, trees will be cut, parking spaces lost and residents at Nutley Lane are opposed to the NTA’s planned space for one bus lane, one general traffic lane and a segregated cycling track, as councillor Paddy McCartan told NewsFour. So to summarize: yes, trees and parking spaces will be lost, but the bus connection through the four sister villages remains, even if there still has to be finalised a solution for the DART crossing at Sydney Parade. By the end of April, all planned public consultations events for phase three will be concluded. Now recommendations, opinions, and hopefully some constructive suggestions can be taken onboard by the NTA to find workable solutions. It will be a long summer wait for phase four to surprise us yet again in September, hopefully phase four will be presented in one proper combined outline where all routes, spines, orbitals are visible.